Color Wow Pop & Lock High Gloss Shellac, Color Wow One Minute Transformation Styling Creamand, and Foxybae Hair Straightening Brush. This post was sponsored by Color Wow and Foxybae. Now that spring has sprung, it’s time for some fresh new celebrity-worthy looks to become the latest beauty trends. While the warmer weather has all of us feeling a little more fresh-faced, it’s time to bid adieu to the frizzy hat hair of wintertime and say “hello” to a summer of luscious locks. Try out these up-to-the-minute hair care products for celebrity style tresses that will make you the star of every sunny day this spring and summer. 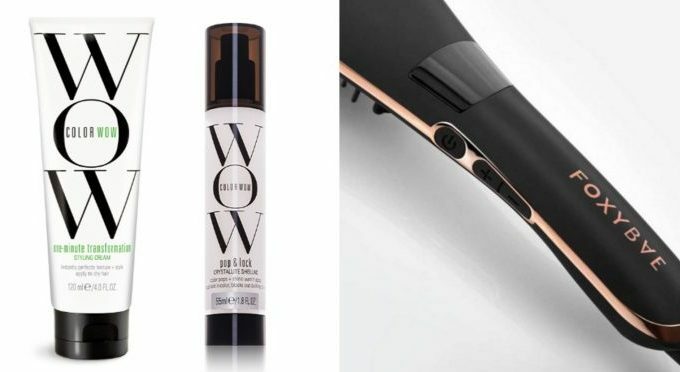 Check out these awesome new products from Color Wow and Foxybae that’ll make your hair look ravishing and red-carpet-ready this summer! Loving the look Ariana Grande was sporting on the red carpet at the 2016 AMC Awards? This sleek high ponytail couples with braided accent sections which make for a look that is simultaneous, sassy, classy and sweet. Think this celebrity style would look great on you too? Get the look with Color Wow Pop & Lock High Gloss Shellac, which Grande’s stylist used to prep her hair for this five-star style. This glossy godsend rejuvenates the hair to make it supple and satiny while covering it in a lustrous sheen to make the beauty of your hair’s color and texture shine from across the room. Is your stellar style getting a little out of control? Never fear, simply apply this miraculous styling cream and in seconds you’ll go from frizzy to fabulous. This beauty must-have is also from the Color Wow family and works in tandem with the High Gloss Shellac to perfectly hold Ariana Grande’s celebrity look together so she can focus on showing off her best poses and picture-perfect pout. This Omega-3 rich styling cream can be applied directly to dry hair for a quick fix for any frizz or flyaways. Longing for smooth, straight hair, but not sure if anything is a match for your waves? Live frizz-free with this hair brush from Foxybae that does the hard work for you, transforming your hair from unruly to unforgettable in minutes. This gorgeous and handy rose-gold brush uses Tourmaline, a crystal mineral, and heat to break down and curb the positive ions in your messy hair, leaving behind shiny, straight hair. Keep your hair healthy and happy with this beneficial beauty staple that will help make your frizzy bad hair days a distant memory. Could these new products be your ticket to straight, shiny hair? Let us know if you’ve tried any of them in the comments!